Their horses splashed through iced-over creeks. 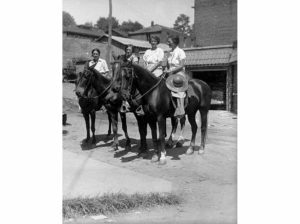 Librarians rode up into the Kentucky mountains, their saddlebags stuffed with books, doling out reading material to isolated rural people. The Great Depression had plunged the nation into poverty, and Kentucky—a poor state made even poorer by a paralyzed national economy—was among the hardest hit. The Pack Horse Library initiative, which sent librarians deep into Appalachia, was one of the New Deal’s most unique plans. The project, as implemented by the Works Progress Administration (WPA), distributed reading material to the people who lived in the craggy, 10,000-square-mile portion of eastern Kentucky. The state already trailed its neighbors in electricity and highways. And during the Depression, food, education and economic opportunity were even scarcer for Appalachians. They also lacked books: In 1930, up to 31 percent of people in eastern Kentucky couldn’t read. Residents wanted to learn, notes historian Donald C. Boyd. Coal and railroads, poised to industrialize eastern Kentucky, loomed large in the minds of many Appalachians who were ready to take part in the hoped prosperity that would bring. “Workers viewed the sudden economic changes as a threat to their survival and literacy as a means of escape from a vicious economic trap,” writes Boyd. This presented a challenge: In 1935, Kentucky only circulated one book per capita compared to the American Library Association standard of five to ten, writes historian Jeanne Cannella Schmitzer.